The Elizabeth Mine Site, one of the largest and most intact historic mining sites in New England, operated for 100+ years producing more than 50,000 tons of copper. 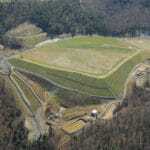 After closing in 1957, remaining mine tailings, waste rock, and smelter waste resulted in acid rock drainage and dissolved metals resulting in surface water and ecological impacts downstream of the site. 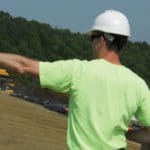 To mitigate these impacts, Nobis was selected by the US Army Corps of Engineers to implement the site closure remedy that included the construction of a waste containment system to reduce acid rock draninage discharges from 3 million cubic yards of waste located within two tailing piles. 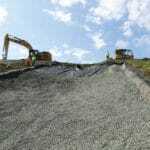 Nobis performed full scale remedial actions that included building demolition/abatement, waste excavation/consolidation, water treatment plant operation and maintenance, and construction of a 43-acre tailing and waste rock landfill and geosynthetic cap. Nobis excavated, consolidated, and graded over 300,000 cubic yards of waste rock and tailings, constructed the final geosynthetic cap, with 60-mil LLDPE geomembrane, operated the water treatment plant for 5 years, and treated 20M+ gallons of acid mine drainage through an innovative lime amendment rotating cylinder treatment system. 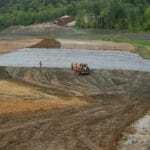 10-acres of wetland mitigation area were constructed and 20-acres of natural habitat were restored. 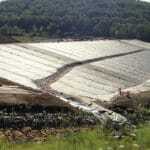 During the installation of the geocomposite material, Nobis’s QC inspectors identified material defects including rupture between the channels of the drainage net. Remedial construction activities were complicated due to National Historic Preservation Act requirements and extreme winter and weather conditions. Nobis’ QC inspectors visited the geocomposite vendors’ manufacturing facility and determined that the material defects were due to the manufacturing process. 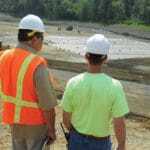 Nobis’ recommendations and corrective actions were accepted by the USACE and USEPA and successfully implemented at a cost savings of $62,000. Worked with stakeholders to employ best practices that protected and best preserved the site’s historic features and resources. 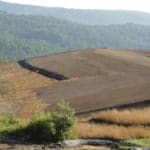 And despite being struck by Tropical Storm Irene, the site experienced only minimal impacts due to proactive emergency planning and employing innovative surface water, capping, and erosion control measures. Nobis was awarded an “Award for Excellence” from the USACE for our storm preparation and response. Nobis saved more than $1.5M during remedial actions by effectively implementing 25+ best practices and construction improvements including: optimizing various performance criteria that allowed for the elimination of several geocomposite and drainage piping system components, on-site re-use of shredded stump grindings as slope stabilization, and eliminating the need to import topsoil by finding and using on-site source area soils. Nobis completed the cap construction ahead of schedule resulting in reduced client costs. The construction of the cap has resulted in significant and ongoing reductions in both acidity and heavy metals to downstream receptors, demonstrating the ultimate effectiveness of the remedy. Nobis successfully implemented several “green” remediation strategies and as a result we received the 2014 USACE National Headquarters Green Dream Team Sustainability Award. Green practices included utilized 210,000 CY of on-site borrow materials that eliminated 14,000 truckloads traveling over local roads, heavy equipment running on biodiesel fuels resulted in 970 tons of greenhouse gas reductions; and other innovative green best practices.